Africa, in Sahel and Sudan Savanna region. Open habitats, preferably grasslands mixed with shallow wetlands and scattered trees. Prefer to roost in trees. About 32 to 36 inches tall; weight approximately 20 pounds. 20 years or more in the wild. Several captive specimens have lived more than 60 years. Omnivorous, eating a variety of plants and insects. Insects are eaten mostly in the breeding season and chicks are fed mostly insects and other small invertebrates. In some areas the birds glean rice or grain fields. The male and female cranes look alike, but the male is slightly larger and makes louder calls than the female. Large red facial (cheek) patches, a golden crown, and long, loose throat feathers make this crane easy to tell apart from other cranes. Juveniles have downy feathers and are reddish-brown in color. Crowned cranes are the only cranes that roost in trees. This behavior is made possible by a long hind toe that anchors the foot to the branch. Parental Care: Both parents incubate and attend the young and stay with them for the first year. They do not begin incubation until the last egg is laid. 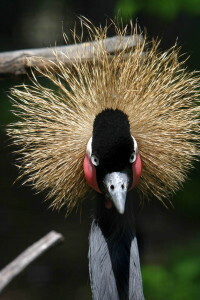 West African Crowned Cranes do not migrate but they will move, as necessary, to various water locations in the dry season. They often gather in flocks around permanent water in the dry season. They do not have a built-in calendar for breeding, as many birds do, but breed in the wet season. When the rains come, mated pairs leave the flock and move to temporary wetlands for breeding. Paired birds build a low platform nest in shallow water. Cranes probably stay together for life after their first successful breeding season but may switch partners if the first attempt at breeding fails. Mated pairs stay close together even when joining dry season flocks. Juvenile birds remain in flocks year round until they mate at 3 to 6 years of age. Suitable habitats for the crane are disappearing due to swamp drainage, dam building, conversion of grasslands to agriculture, and overgrazing of domestic cattle near lakes. Because they are unable to survive in polluted waters, they are good indicators of habitat quality. In some areas the birds are hunted for food or sold to bird collectors. 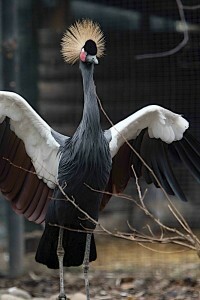 The West African Crowned Crane is the national bird of Nigeria. A captive crane in the garden is supposed to keep a leader in power. 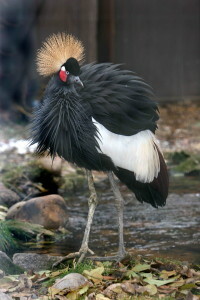 Zoo Boise exhibits the most endangered of the two sub-species of West African Crowned Cranes (Balearica pavonina pavonina).